Prandial insulins are used to regulate glycemia after a meal. In a healthy individual, meal consumption immediately triggers insulin secretion to metabolize carbohydrates. This secretion decreases when the blood glucose level goes down again. To mimic this ‘physiologic’ action profile, injected prandial insulins must act very rapidly and for a duration limited to a few hours. Currently marketed products take some time before they start acting, that is why insulin analogs should be injected 5–15 minutes before meals, whilst human recombinant insulin must be injected 30 minutes before. An ultra-rapid insulin is an insulin that has a more rapid absorption profile than the rapid-acting insulin analogs currently on the market, aiming to mimic the immediate secretion of insulin when a non-diabetic person eats a meal. Indeed, an insulin that could be dosed at mealtime is expected to be beneficial, as knowing the exact time and content of the meal at the time of injection would help avoid under-dosing, overdosing or delayed dosing. These can lead to hypo- or hyperglycemia, which may result in severe short and long-term consequences. A faster-acting insulin would also provide patients with more flexibility regarding injection time, which is important in day-to-day life. Finally, ultra-rapid insulins are considered a key element to facilitate the development of fully-automated insulin pumps (also called an ‘artificial pancreas’) that deliver insulin automatically, in real time, depending on continuous monitoring of the patient’s blood glucose levels. To address the need for an ultra-rapid insulin, Adocia has developed two ultra-rapid formulations of insulin analog lispro: BioChaperone® Lispro U100 (standard insulin concentration: 100 IU/mL) and BioChaperone® Lispro U200 (twice as concentrated solution, i.e., 200 IU/mL, especially adapted to people with high insulin needs). BioChaperone Lispro has been tested in 9 positive Phase 1/2 clinical trials to date, in people with type 1 and type 2 diabetes, and across multiple insulin delivery devices. It is now ready to enter Phase 3. Some of the main results from these studies are listed below. In June 2015, Eli Lilly and Adocia announced topline positive results from the first meal study of BioChaperone Lispro U100, showing that BioChaperone Lispro injected at the time of the meal was associated with a 61 percent reduction in post-prandial glucose excursion over the first two hours compared to Humalog. This study also confirmed the ultra-rapid pharmacokinetic profile of BioChaperone Lispro by demonstrating that insulin lispro’s speed of absorption was significantly faster: early insulin exposure increased by 168% at the same dose for BioChaperone Lispro compared to Humalog. 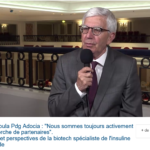 In December 2017, Adocia announced positive topline results for a Phase 1b clinical study comparing BioChaperone Lispro both to the rapid-acting insulin Novolog® (Novo Nordisk) and to the recently approved ultra-rapid insulin aspart formulation Fiasp® (Novo Nordisk) in patients with type 1 diabetes. This study was the first direct comparison of two ultra-rapid insulin formulations. The objectives of the study included comparing the glucodynamic effects and pharmacokinetic profiles obtained with the three treatments when administered through an insulin pump. BioChaperone Lispro met the primary endpoint, showing a statistically significant increase of 63% in metabolic effect during the first hour compared to Novolog. This result confirmed the ultra-rapid profile observed in previous studies when compared to Humalog (insulin lispro, Eli Lilly). Furthermore, BioChaperone Lispro showed a statistically significant ‘faster-off’ metabolic profile compared to the other two products, reaching the late half-Tmax 18 minutes before Fiasp and 22 minutes before Novolog. BioChaperone Lispro also showed an early metabolic effect similar to that of Fiasp during the first hour. In March 2016, Lilly and Adocia jointly announced positive topline results of a study evaluating the effect of repeated administration of BioChaperone Lispro on glycemic control after a meal (three administrations a day, for 14 days). 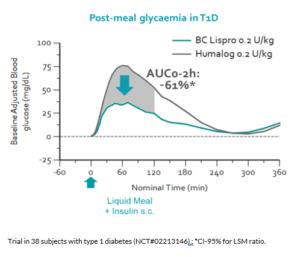 At the beginning of each 14-day treatment period, BioChaperone Lispro U100 demonstrated a statistically significant decrease of 31% of the glycemic excursion during the first two hours, compared to Humalog®, when treatments were injected at the time of a standardized solid meal. At the end of the 14-day treatment period, that difference reached 42%. The robust performance of BioChaperone Lispro after two weeks, in close-to-real-life conditions of use, is one of the key take-away messages of this study. It also showed a very good tolerability profile for BioChaperone Lispro after outpatient repeated administration. 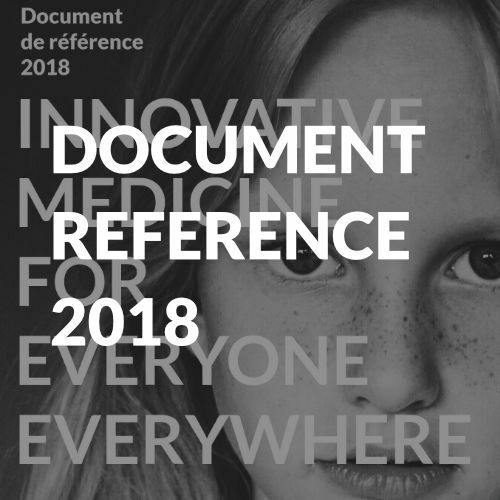 In April 2016, Eli Lilly and Adocia announced that, during a 14-day period of treatment in people with type 2 diabetes, BioChaperone Lispro U100 showed a statistically significant 22% reduction in blood glucose excursions during the first two hours compared to Humalog when the treatments were injected at the time of a standardized solid meal. In December 2015, Adocia and Eli Lilly jointly announced positive results for a pilot bioequivalence feasibility study, which triggered a $10M milestone payment from Lilly. The study aimed to test the potential bioequivalence of BioChaperone Lispro U200 and U100 formulations. The results showed that BioChaperone Lispro U200 met all predefined endpoints and retained the ultra-rapid profile of BioChaperone U100. Consequently, BioChaperone Lispro U200 could be developed as a bioequivalent product to BioChaperone Lispro U100; in this case, only one additional pivotal bioequivalence study would be needed to submit the product for approval, based on the dossier for BioChaperone Lispro U100. In April 2018, Adocia and Chinese company Tonghua Dongbao announced a strategic alliance to develop and commercialize BioChaperone Combo & BioChaperone Lispro in China and other Asian and Middle East territories. In June 2018, Adocia further announced two additional agreements with Tonghua Dongbao whereby Tonghua Dongbao would supply Adocia with insulin lispro and insulin glargine globally (with the exception of China), enabling Adocia to advance its key BioChaperone Lispro and BioChaperone Combo programs and to diversify partnership opportunities. Adocia retains the rights to develop and commercialize BioChaperone Lispro and BioChaperone Combo in the US, Europe, Japan and Latin America. January 3rd 2019: Adocia Announces the first trial to test the ultra-rapid insulin BioChaperone Lispro using an autonomous insulin delivery system, namely Beta Bionics iLetTM. This, multi-arm, cross-over, USA-only clinical trial, will recruit up to 30 people with type 1 diabetes to participate in three 7-day study arms comparing the pharmacokinetic and pharmacodynamic profiles between and within subjects of insulin lispro, insulin aspart, and BioChaperone Lispro using the insulin-only configuration of the iLet.